Please remember that these news items were important at the time of their release, but may no longer have any urgency. So it is not necessary to follow up on them. 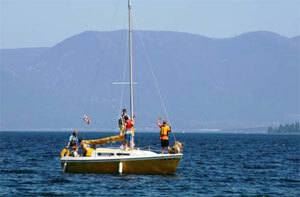 "I am again recruiting volunteer instructors to assist with the Adult Sailing Program this summer at Camp Melita Island. We are running four weeks of campers July 12 through August 7. Last summer's program was so popular we lacked enough instructors for the high demand. We would prefer instructors to commit to a week of their choice, however if someone would like to help for longer, no problem. "Instructors will receive free room and meals (camp style sleeping) at Melita Island and can bring family members with them to the island. They would teach a 2- to 3-hour morning and afternoon session Monday through Thursday (and maybe a Friday morning) of each week. Another variation could be that an instructor could teach just a morning or afternoon session. An instructor can use his own boat or we can provide a boat. Expect 4 to 6 students per class. This is a basic entry-level sailing class. "Many adults have said this was one of the most memorable events in their lives." For more information, Chris' phone number is 406 549-3090; his email address is croberts@powwowcountry.com. For more about Melita Island, go to <http://www.melitaisland.org>. Penny TerHaar has a special sort of "Looking For" request for our readers. She writes: "I grew up sailing on Alberg 35 #169. My dad is going to be 90 years old and would like to see his old boat. It was built in 1965 with a diesel engine and white hull. It originally was in New York, then Chicago, and then my dad sold it to someone in the Kentucky Lakes area. Please let me know if you have any suggestions about how I can find it. Any help is greatly appreciated!" So if you know the whereabouts of Alberg 35 #169 or any Alberg 35s on Kentucky Lake, please contact Penny: phaar10@gmail.com. During the month of February, Mark Doyle has a free special offer you may want to know about. Mark and Diana Doyle are the publishers of the Managing the Waterway Electronic Chart and Nautical Reference Library, a complete updated collection of all U.S. nautical charts for use with computer e-charting systems on DVDs. The DVDs also include nearly 200 government publications, reference texts, and nautical calculators for U.S. and International waters. This month, to celebrate the fifth anniversary, they are offering a buy-one, get-one deal: buy their DVD set of charts ($39.95) and get a free copy of their book about electronic charting: Get Onboard With E-Charting (valued at $34.95). Visit <http://www.managingthewaterway.com> for more information.